For those idiotic enough to think that Chavez opened a new era and ushered in a new man: you are right but you are not going to like it. 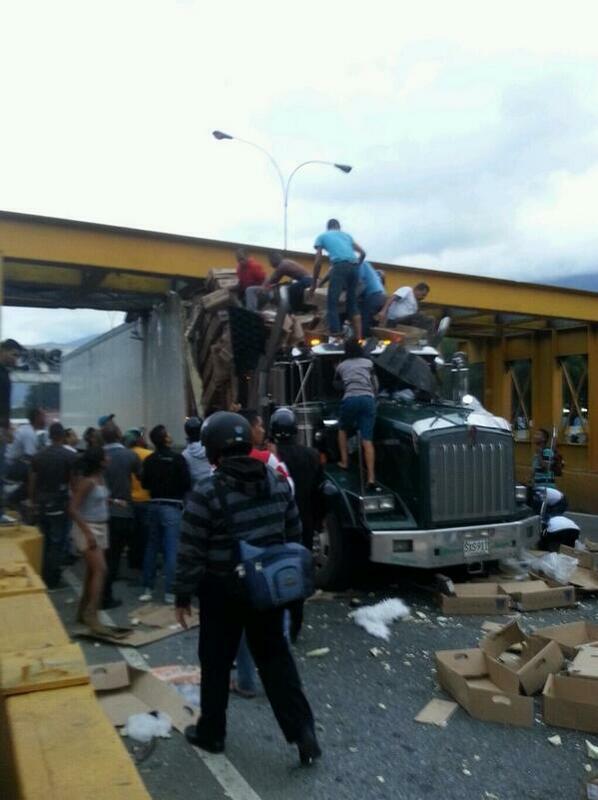 This morning a truck broke the security barrier in a Caracas highway exchange and got stuck in the middle of the highway. The truck carried packs of frozen meat. It was 6 AM. Within minutes there were already people trying to loot the truck instead than trying to save the driver, who ended up dead later. The cops came and stopped for a while the actions. 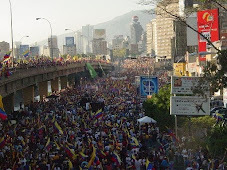 But since the Caracas main highway was paralyzed, motorbikes came from all around and started trying to rob all the unhappy drivers stuck in traffic. So there you have it, 14 years of Chavez socialism and we are left with a large group of people who think that they can grab whatever they want, at any price, shocked, SHOCKED when actually some authority tries to explain to them that no, they cannot do so. Note: the society of motorbikes is a creation of chavismo who has subsidized them heavily in the early years because they were their storm troopers to quickly go around town to crush any anti Chavez protest. Remember Lina Ron? Now they are out of control, a threat to regime itself. One shudders at the idea that suddenly 300 bikes could appear in a neighborhood and start looting while the cops look helpless. Because they are armed, you know, the bikers, better than the cops probably. The problems we face to rebuild Venezuela are much, much worse than a matter to find money for reconstruction, putting finance in orders, supporting business to produce and hire people. We have become a society of looters, robbers, abusers, drug traffickers, and what not, to a degree of cruelty and violence that leads us to prison riots where the hearts of the victims are pulled out of their chests. Viva Chavez, carajo! How did the driver die? Just says he 'died in the accident' in the Universal but the cab of the truck is intact...killed trying to protect his load? Drivers left alone never try to defend their load for long. One of the looters will start to throw stones and the driver will have to run for cover, least they also take his wallet, cell phone and life. The most drivers do in such frequent circumstances is to confront looters for a few minutes in the hope police arrives. But once looting has started in earnest not even police will try to stop it. It appears the front end of the trailer sheared open and the contents thrust onto the cab. Was the driver crushed? Apparently though details not available yet. If that werethe case it makes matters worse. Looters were busy emptying box spelled rather than helping the driver. You don't think the looting would have happened before Chavez? About 15 years ago, an acquaintance was driving near Maracaibo late at night, when he swerved to avoid hitting something. He flipped his car and was hanging upside side, from his seat belt, and slightly groggy, when he felt hands reaching inside the car. They tried to steal his watch and wallet. He had to yell and fight them off. Of course! Looting is the second oldest office in the world. However civilized societies act against it, Chavez never did. Looters in civilized countries that take advantage of disasters are immediately arrested or shot. In Venezuela this behavior is tolerated.Disgusting and repugnant.How embarassing it must be for civilized Venezuelans. This already existed before Chavez, Daniel. If you do not believe me just look at the Caracazo. When man is believed unpunished, our worst comes to light. You cannot compare an act of collective folly with a specific one away from Residencial areas (it was Los Ruices) which was led gangstyle by bikers. This is another dimension. The point, Daniel, is that the looting Venezuelan culture existed long before Chavez, that all he did was make things worse in this area, more anything. Or perhaps I should also mention the looting during the tragedy of Vargas? Pablo, what happened Friday was a qualitative jump, not a quantitative. Or to use your examples how often did 300 motorbikes arrived to loot a truck in AD times, or in Vargas? This is a different type of looting, it is an escalation that the government seems unprepared to control. Por favor que alguien me muestre un comunicado del gobierno donde las autoridades rechacen estas acciones.